A video has emerged depicting what witnesses are calling a UFO being shot out of the sky by military jets. The video shows a fast flying glowing orb and one or more jets can be heard following close behind. Moments later, an explosion can be heard and seen followed quickly by a plume of smoke and falling debris causing bystanders to scream and scatter. A part of the UFO debris crashes on the ground and the cameraman is almost knocked over by the blast. 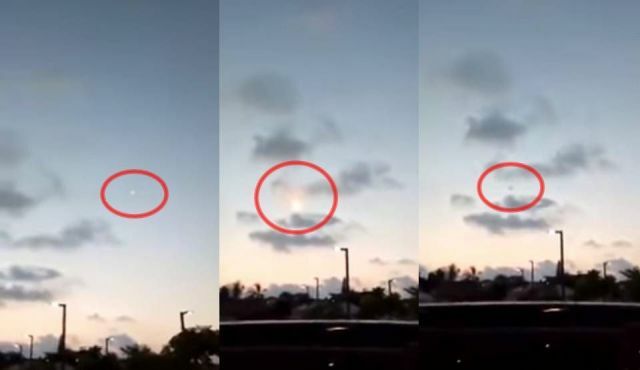 Could this have been an actual extraterrestrial object flying in Earth's atmosphere and being targeted by military jets? Or is it possible that this is something else like a missile? A Twitter user named UFO Sightings Daily slowed down the footage to make it easier to discern what happened. Oh ya, 34309, you can see drones as orbs. Use your head! Because not all drones are subsonic . Not all drones have wings. UFO does not mean alien spaceship, it just means Unidentified. It;s a Bollide, an exploding Meteorite. On February 5, 1985 brothers Bill and Bob Clark saw a sea serpent. So from the research I've done it seems it may be a missile that was then shot out of the sky by anti-air defense. Israel has what it calls the "Iron Dome" because Gaza fires so many missiles at Israel it must use anti-missile technology to keep itself safe. The Iron Dome anti-missile launcher network is one of the most advanced in the world. Military crap… Any alien with self respect wouldn't get caught. Rocket engine burn produces a circular bright glow. Also Friday Night USA and Europe have reported several large Low Angle Meteors …. You are right it is the video from rockets hitting Israel. A couple weeks ago. 150 missiles fired from Gaza Strip.